It took quite a few years for fans to realize that this was not an original composition for the band, but technically a cover, albeit with rewriting similar to how the band later handled Argent’s “God Gave Rock And Roll To You II.” The song had originally appeared on the 1979 Bachman-Turner Overdrive “Rock And Roll Nights” album. Jim Vallance had been both a co-writer and producer on that album, though at the time the song was solely attributed to Jim. The original form was an angst ridden ponderous song. 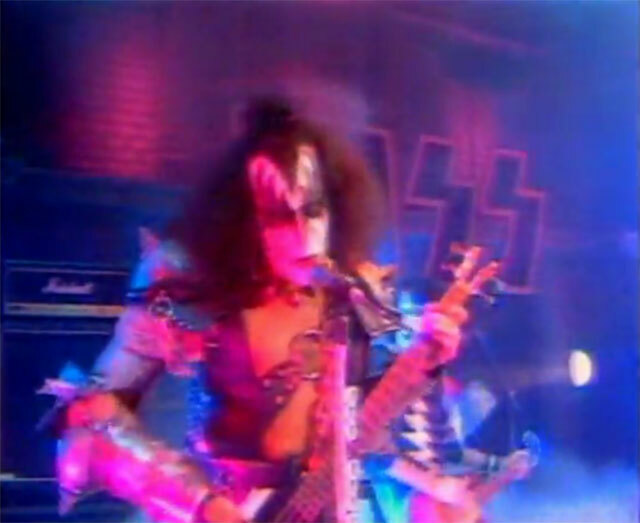 Only the chorus really retained and resemblance to the version recorded by KISS. During April 1982 Bryan Adams and Jim Vallance reworked the song giving it a new lyric and a heavier overall feel. They submitted it in July 1982, along with “War Machine,” to producer Michael James Jackson for consideration for KISS to record. According to Jim, “About a week later we got a call from Gene Simmons. He said he loved our tracks and KISS were interested in recording them. There was just one problem – ‘Rock ‘N Roll Hell’ needed an extra verse! Adams and I were in the same room, on separate phones. We looked at each other and shook our heads. The song was finished. Why on earth would Gene want us to write another verse? We told Gene how we felt about it. There was a moment of silence on the other end of the line and then Gene spoke, very slowly and firmly: ‘You don’t understand,’ he said. ‘The song needs an extra verse. And I’m going to write it.’ Suddenly it dawned on us. The song didn’t really need an extra verse. Gene was simply trying to tell us, in not-too-subtle terms, that he wouldn’t record our song unless his name appeared as a co-writer – and unless he received a portion of the royalties! We’d just been bullied, and the choices were obvious: we could have partial credit on a KISS album that would probably sell 10 million copies, or we could have zero credit on the album – and zero royalties! Regrettably, we gave in to Gene’s demands. And while the experience left us with an empty feeling, it also served as an important lesson for the future. We never relinquished credit to anyone again” (Jim Vallance).